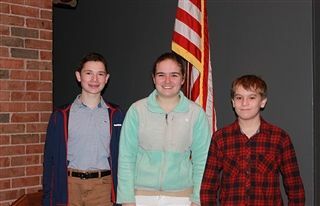 With the high stakes possibility of scholarship money on the line if they qualify and win in the national contest, the eight finalists in the National Geographic Geo Bee - Eli Brandt ’23, Zora DeRham ’23, Jordan DiMauro ’23, Ignacio Feged ’23, Cameron Hart ’25, Will Jacobs ’23, Hana Roggendorf ’23 and Theo Stephan ’23 sat at a long table on the stage in the Roberts Theater, steeled with the cool certitude of a 16th-century Portuguese explorer with a dubious map. The middle schoolers in attendance, as amped up as any game show audience, fidgeted with nervous attention. Some were drumming their hands on their laps; others were humming the Jeopardy “think music.” The host for the Geo Bee, Middle School history teacher Andy Krugman, read the rules for the grueling test of wits and waterways. With the 15-second timer alternately pinging, the questions and answers sped around the globe. Oslo! Bucharest! Lima! Ottawa! Caracas! A new format question, which tested the students critical thinking and knowledge of the real world, asked the students to read a map of the fictional city of “Geoville” to determine the best location out of four on the map to grow a community garden. Slowly, the contestants were picked off, and to ease the apprehension, Krugman served up another riddle: “Q. Where’s the English Channel? A. It depends on your cable provider.” More half-hearted laughing surfaced from the crowd. The contestants maintained their composure as the audience bit their fingers. After answering a series of brain stumping questions with the answers pointing in the direction of Tikal, Great Bear Lake, and the North European Plain, Zora DeRham emerged as the automatic finalist. Eli Brandt and Cam Hart battled to faceoff against DeRham in the championship round. Hart earned the slot. DeRham and Hart tested their topographical talents, but DeRham nailed her answers and secured the win by knowing that Darein National Park, where jaguars roam, is located in the Central American country of Panama. But, you knew that, didn’t you? Next, DeRham will take a proctored online qualifying test for the state level. Based on those scores, the top 100 students from each state move on to the nationals.